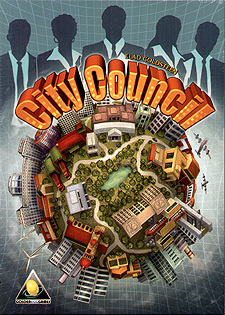 In City Council each player takes the role of a council member of a newly founded city. The government has selected the members of the city council for the first few years, until the city rises and flourishes, by which time the most popular member will receive the position of mayor. In order to build the city, you and the other councilmen must maintain a low level of pollution, fight crime, create jobs, and sustain an adequate city budget. If you and the others don't keep up the good work, the city project might not succeed, the government will take over, and the players will all lose. While the city grows, different political groups try to impose their will by knocking on your office door and asking you for small "favours". In return, they offer you their support and you gain influence, possibly allowing you to become the city's first mayor.